The legislature. The governor has veto power over both congressional and state legislative district plans. No public hearings are scheduled. There is a possibility that proposed plans will be posted on a website. West Virginia lost one U.S. House seat following the last redistricting cycle. This forced two Democratic incumbents to run against each other in the primaries. In 2001, the state will need to be redrawn significantly because of a major shift in population, with the 2nd congressional district picking up seats at the expense of the 3rd. 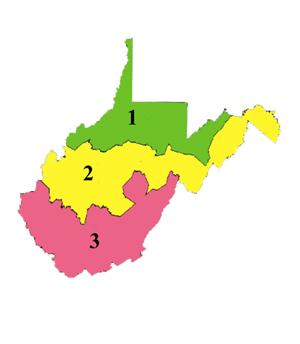 West Virginia's congressional district plan was challenged on equal population grounds in 1992; the overall deviation from equality was 0.09 percent. The plaintiffs alleged that the legislature had no compelling reason for such deviations, but the federal court disagreed. The court found that the population deviations were necessary to preserve the inner cores of previous districts, a legitimate interest. In 1993, the state legislative district plan was challenged in federal court on equal population grounds as well. The court refused to consider the plan's overall population deviation range of 9.97% as preliminary evidence of an equal protection violation. The court found for the defendants. The generally recognized legal threshold is 10%.